Today’s post is a process rather than a strict recipe. It is adaptable to any type of fruit. Use what is fresh, local, and in season. These are great for kids (or kids’ at heart). 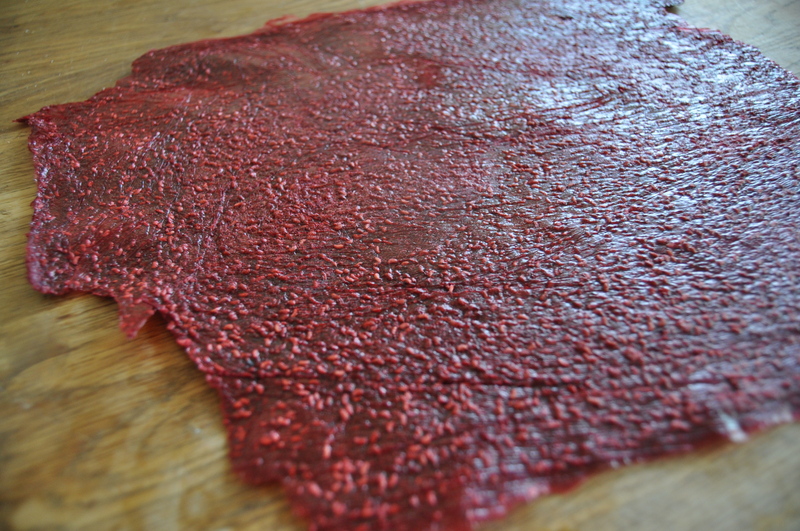 There are a lot of fruit leather recipes which require a dehydrator. While this is a great way to make it, it is not accessible to everyone. If you have a dehydrator, feel free to dehydrate these babies until pliable. You can also use an oven, set at it’s lowest setting for a few hours….but that’s no fun 🙂 My method is part cooking class, part science experiment. Get your kids involved in making this. Let them pick the flavours and be part of the process. Experiment with different kinds of fruits or combinations of fruits. I have noticed that kids are naturally very interested in cooking and I love to encourage that curiosity. Blend your fruit in a blender or food processor until smooth. Add sweetener of choice (I use raw honey, but you can use coconut sugar, stevia, or whatever you prefer) to taste. How much you need to add will depend on the sweetness of the fruit. I used about 3T honey for 5 cups of raspberries, but this will vary for everyone. Taste and adjust sweetness for your taste buds. At this point you can add additional spices or herbs if desired. Get out your baking pan (cookie sheet) and line it with a silpat if you have one. If not, you can use plastic wrap (I did). Pour the blended fruit onto the lined baking pan and smooth to an even thickness. Make sure it goes right to the edges. Place outside in direct sunlight (I use my deck). There are many factors that determine how long it will take to dry. Mine took 12 hours on a 30 degree C (90 degree F) day. The best thing you can do is check on it every few hours (or when you remember). Involve your kids! When the sun moves, move the tray so that it is always in the sun. 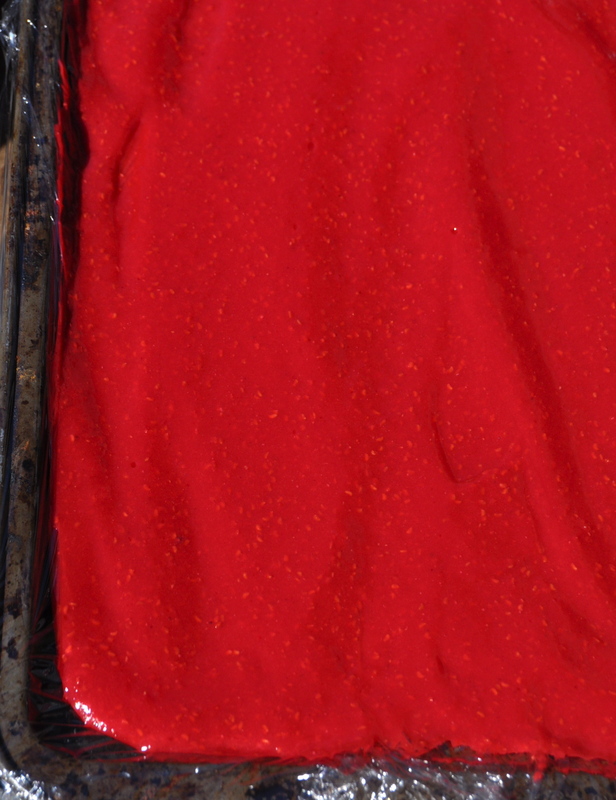 Once fruit leather is dried, but still pliable, bring the tray back inside. The colour will have darken drastically. Peel leather from silpat or plastic wrap. Roll up and slice in pieces. Eat! If you need to store them, wrap in parchment or wax paper and store in an air tight container. 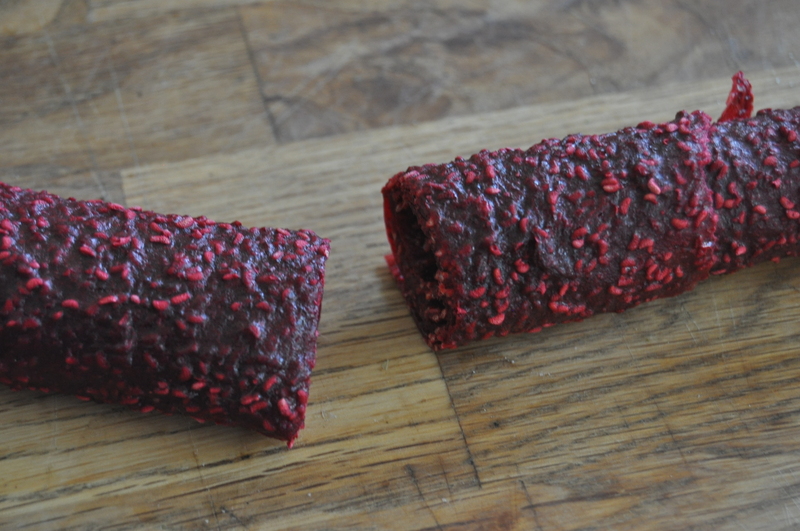 This entry was posted in raw, snack, vegan, vegetarian and tagged dairy free, fruit, fruit leather, healthy, natural, sugar free, summer, sun dried, vegan. Bookmark the permalink. Wow, that’s great! Thanks for the process recipe 😀 I will have to try it. Did you have any problems with insects landing on it while it was out in the sun? Thank you 🙂 good idea. 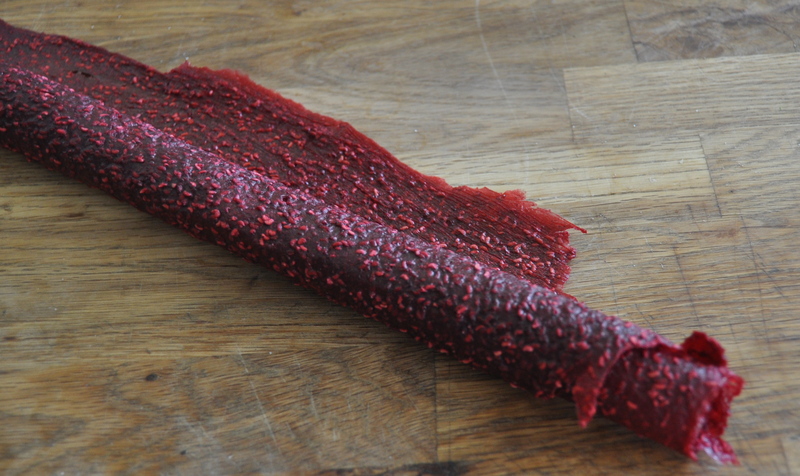 I really want to make some fruit leather! 😀 I will! First I need to find some fruit…. What did you do to keep the flies from landing on it? Well, SNAP again dear Megatarian. Just this morning I went to examine the Gooseberry Fruit Leather I’d made (with a little water kefir to ferment it as per recipe on Cultures for Health. I used a low oven (sun unreliable in Wales) and parchment paper, to which all the leather stuck. So it looks a mess now trying to get it off. I guess the silpat is a good idea, couldn’t imagine putting plastic wrap in the oven. I’m a little disappointed actually because the taste is no nice. Anyway…. take care…. lol were we separated at birth? Sorry the Gooseberry’s didn’t work out for you! I was even a little hesitant to put the plastic wrap out in the sun, but everything I’ve read said it wouldn’t get hot enough to transfer anything and was totally safe…time for us both to invest in some silpats! 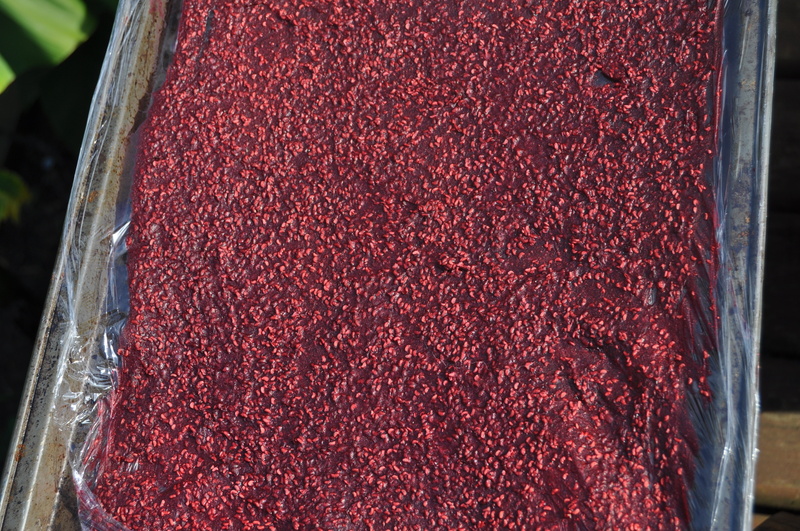 Our quince tree is a great source of fruit for leather. But I had a disaster the year I had 16 trays of of the stuff drying in the backyard. A flash thunderstorm storm hit while we were out and I came home to floating quince. Never could get it dried out. I probably still have nightmares about that.